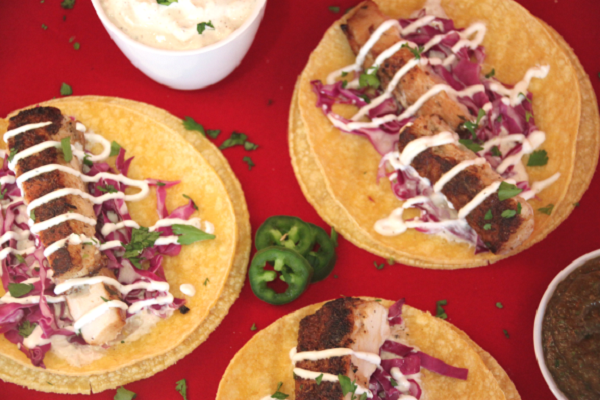 Mahi Mahi blackened with just the right amount of heat for bold flavor and enhanced with white crema, red cabbage and a roasted salsa in a double corn tortilla. Served with cilantro rice. Mahi Mahi, cabbage, cilantro, jalapeno peppers, onions, tomatoes, lemon juice, dairy, oil, spices. Stove Top: Add 3 tablespoons of oil to a skillet and heat on medium high heat. Once oil is hot, cook fish about 3 minutes per side until cooked through. Grill: Preheat Grill. Brush grill with oil. Grill fish 3-4 minutes per side. Warm tortillas and rice. Optional: Flake fish with fork. 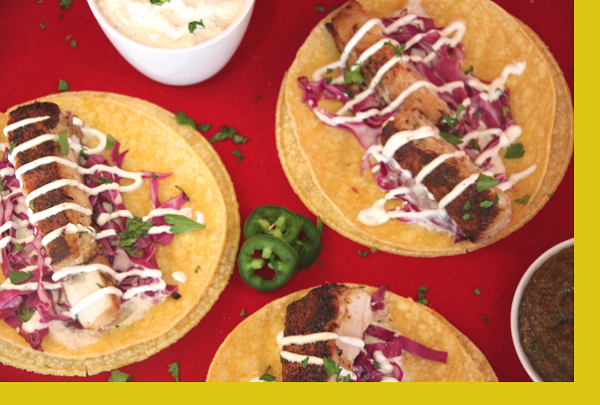 Serve with cabbage, white crema and roasted salsa. This fish tacos were delicious and my husband and son raved over them. Highly recommended!! !